(Nanowerk News) Azulene is an aromatic molecule with a rare, deep-blue color that sets it apart from other organic compounds. Recognized for over 500 years as a natural pigment, azulene’s unusual color results from an electronic interplay between the two main structural components, fused five- and seven-membered conjugated carbon rings. Recently, scientists have begun to exploit azulene’s optical abilities by incorporating it into materials such as liquid crystals and conductive polymers. 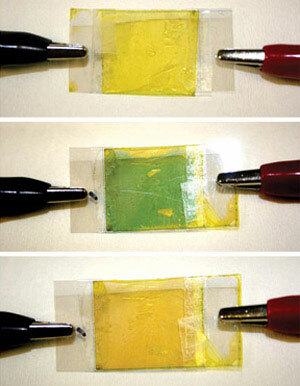 Now, Jianwei Xu, Chaobin He and co-workers from the A*STAR Institute of Materials Research and Engineering, in collaboration with researchers from Nanyang Technological University in Singapore, have combined azulene with a polycyclic organic molecule called fluorene to produce a series of polymers that can change color on demand using either a chemical or electronic stimulus ("Synthesis, Electronic, and Emission Spectroscopy, and Electrochromic Characterization of Azulene-Fluorene Conjugated Oligomers and Polymers"). This discovery may usher in a new generation of ‘smart’ materials, such as windows that can change from clear to opaque with the flick of a switch.